Once again it time for us to start our fall cleaning. I use this time to purge the clothing that is outgrown and to get rid of those things that we no longer use. The boys and girls worked on their rooms. Since this is usually met with great procrastination an attitude I gave them a challenge. They had to have their rooms completed to my standard of clean by 3:00 PM. If they did not they would lose all electronics for the month of October. I know is seems harsh, but that is a great motivator for my teens. Nothing too horrible to maintain, but they have had a horrible time keeping the room clean lately. Part of it is my fault becuase I haven’t been around much the past two month to have consistent enforcement of these standards. Thankfully things have slowed down for the time being and I will be around to check the rooms a couple of times a day to make sure the cleanliness becomes a habit. To help with this I have come with chore “cheat sheets” for them. I have printed up what I expect them to do daily and weekly. I have printed them and laminated them. That way they can refer the “procedures” that to be done each day and each week. I am hoping the visual cues help them to ingrain the habit without me constantly nagging the chores done. Here are links to the Daily List and Weekly List I created. I have it hangin on the hook on the back of the door. Both Liz and Mandy are attending Harford Community College this year. 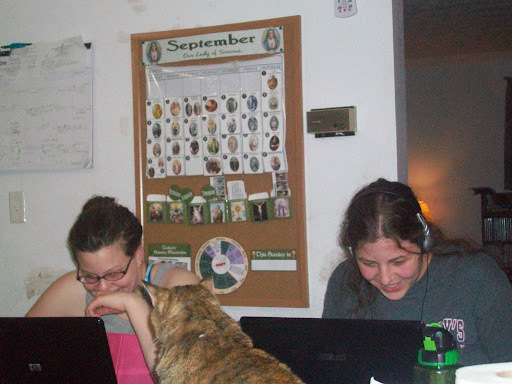 Liz is working towards an Associates in Math and Mandy has just started working on an International Relations degree. At the community college a year of foreign language is required so both intependently decided to take French. And since only one French class is offered, they are in the same class. It makes for some interesting happenings at both the college and home. To add to the fun it is a hybrid course, which means the class meets once a week in a classroom and the rest of the assignments are done on the computer. Overall Mandy has a major advantage because she took four years of French as part of the International Baccalaureate Program. This is Liz’s first time taking the language (she took Spanish in high school). So frustration happens for both of them at times. Mandy because the class it truly beneath her (but hey it is an easy A and won’t hurt to to pad the GPA) and for Liz because she thinks she should be able to keep up with Amanda. Both are looking intense working on their computers to get the assignments done. They realized I took this picture when the camera flashed. This is them laughing because of the previous picture. The cat in the picture is our 11 year old Willoughby. She considers Mandy her human and is highly upset she is not the center of attention. This month starts the six months of the Blasdell gift-giving extravaganza. My previous post told about Liz celebrating her twenty first birthday. Today Douglas turned 14. Then we have a three week break. Abby, Maggie and Marian will turn six in mid-October. After their birthday, we have the holiday season with Thanksgiving and Christmas. Then we have Becky’s, Emma’s and Patrick’s 13th birthday in Febuary. Finally toward the end of March Mandy has her birthday. This gift giving season could break our bank. We prepare for it several ways. First, we have a budget of how much we will spend on gifts. We have a birthday budget and a Christmas budget for each child. We also set up an overall Christmas budget for all the gifts we will be giving for everyone on list: nieces and nephews, brothers families, and friends. This gives us some wiggle room if there is a must have present which may go over the per person budget. Second, we start putting the money away for the next holiday season now. I like to have the presents identified and purchased by the beginning of October. Purchased usually means layaway, especially for the larger gifts. I LOVE layaway at this time of year. Even though I could purchase the gifts and bring them home now, having them on layaway gives me a place to hide them for most of the holiday season. Trying to find a hiding place for all the gifts is impossible, since I have nosey and sneaky little people who like the thrill of finding the hidden is more fun than the surprise of receiving the gift. Yes, my children are fun that way. Even having a limit of five gifts equals 45 gifts under the tree for just the children. When you add the presents for Richard and I, and other family and friends we with which exchange gifts you are looking at a tree with about 100 presents under its branches. It makes for one well loaded tree! I hope you are starting you Christmas plans! I arrived home this afternoon after spending the weekend in Virginia with Mom. I was supposed to head home yesterday, but Mom woke up with pink eye. How in the world she came down with that, I don’t know. The hospice nurse came out and was able to get an ointment prescribed. So I had to hang around to pick up the medicine in the early afternoon. In addition her new home health nurse was supposed to arrive at 1:00, but she called at 1:25 and said she didn’t like dogs so we needed to lock up Jake. Honestly that didn’t bother me, I would have locked the dog up, but calling at 1:25 and demanding we lock up the dog, just rubbed me the wrong way. So I told her not to bother coming. Today the replacement home health nurse showed up and was severely allergic to cats (Mom has three). All this information about pets is provided in Mom’s client profile. I guess people just don’t read anything any more to discover information. They must expect people to tell them everything. Now to find out who they find for Thursday. I think it will be interesting. When I arrived home this afternoon, Abby came running out to me at the car and told me in no uncertain terms that I said I would be home yesterday to go to the Parish picnic and she was upset I wasn’t there. I apologized and told her that Nana was sick and I had to stay and help Nana. She was okay after that discussion. I also told her, I was home now and other than my physical therapy appointments and taking Liz and Mandy to the college that would be home with them all week. Now I am praying Mom stays well and I don’t have to make another mad dash to Virginia. I hope you all had a wonderful and uneventful weekend! I had planned on starting home school at the end of July, but the best laid plans sometimes don’t work out. We ended up starting at the beginning of August, just in time for me to head to Mom’s for ten days while my brother was out of town. While I was there, Mom came down with an upper respiratory infection; never a good thing for a person with severe COPD. She was quite sick for about two weeks. Thankfully Mom is under Hospice care so we were able to have the nurses out several times to check her progress with she was going through this cold. She slowly recovered and is gaining back her strength. 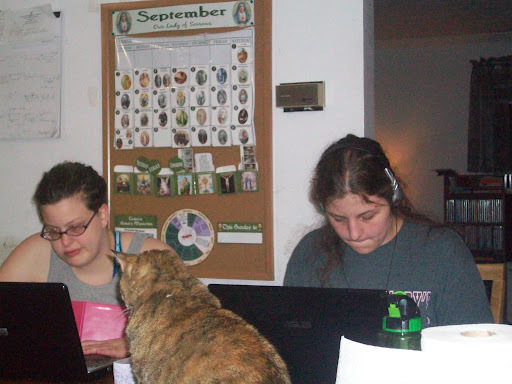 This was another set back for the homeschooling schedule and routine. We just can’t seem to get into a rhythm of consistent schooling. It is very frustrating for me as mom who wants to educate my children. I am hoping things settle down and I can stay put more to oversee them while they do school work. Richard is doing a great job holding down the home front, but it hard on everyone with me not at home. On a positive home school note though, my little girls LOVE school. They let me know when it is time to work with them. We do a lot of the work as a group and then I work with them one on one for phonics and reading. They let me know when something in the daily work plan is missed. I have pulled together an eclectic mix for their schooling which they enjoy. I hope you all enjoyed the rest of your summer and your fall is off to a wonderful start!